The focus team assisted with our kitchen redesign and full renovation from start to finish. Our experience dealing with David & Tina was really good. We loved working on your house Louise! We're so happy with the final outcome. The finishes you chose were beautiful, can't wait to get some photos. Thank you very much, your ensuite looks great. It was a pleasure working with you. Cannot thank David, Tina and the team enough for the amazing job they did my full kitchen and bathroom renovations. Thank you Monica, you were an absolute pleasure to work with. We would like to thank Dave & Daniel for the terrific job they did on our small bathroom. Thank you for the referral Pauline, I has been a pleasure working with you and your family. Daniel would adopt your dog if he could! 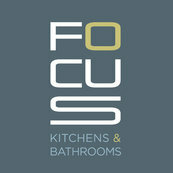 Focus Kitchens & Bathrooms have supplied our cabinets on several projects and have been of a very good quality. It was a pleasure working with you Hele & Peter on your Kitchen & Dining Room renovation. I'm Looking forward to working with you on your next project, an Outdoor Kitchen and pergola. Thank you for the feedback, it was great working with you. I hope your new tennants are very happy in their new home. Looking forward to working with you on any future projects.